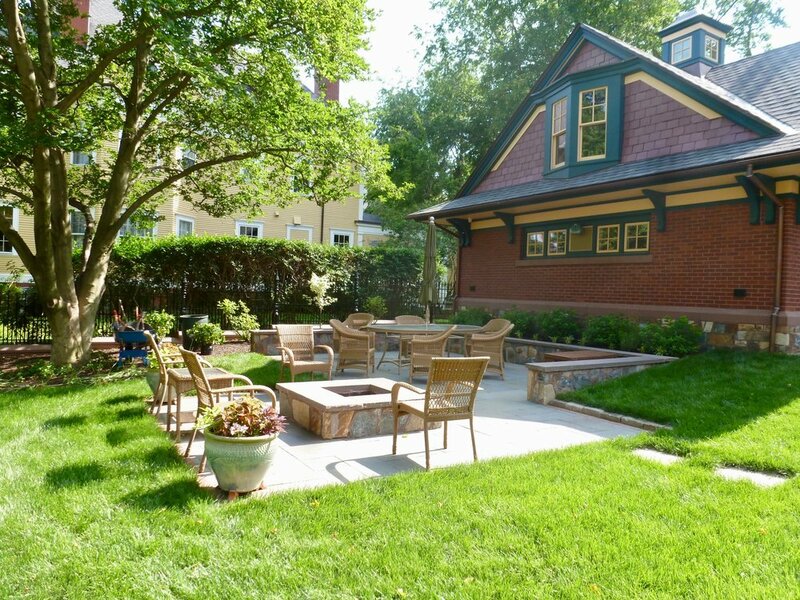 The clients of this beautiful Queen Anne Victorian first consulted with Sunflower Designs while they were building a new garage/carriage house which was designed to look like it had always been there. As such, they wanted a landscape that would complement the style of the house and garage, and also look timeless. The construction of the garage led to a completely new landscape, including moving the driveway from the north side of the house to the adjacent street on the east, and adding a new patio edged with dual purpose retaining/seat walls . The changes also allowed for a new grander entrance to the front of the house, which faces the yard rather than the street. The beautiful front facade of the house which was once obscured by yew hedges is now visible from the street and highlighted by a beautiful cast and wrought iron fence atop a fieldstone veneered knee wall. Plantings include classic plants such as hydrangea, roses, peonies, boxwood and more. Landscape Contractor: Staton's Landscaping, Inc.